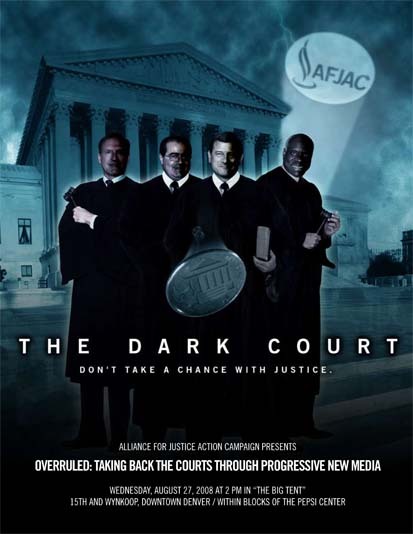 Last week while in Denver, I had the pleasure of attending an event put on by the Alliance for Justice Action Campaign ("AFJAC"), titled "The Dark Court. Don’t Take a Chance with Justice". AFJAC presented some very sobering and stark facts about the federal judiciary. Ten of the thirteen federal appeals circuits are “dominated by the conservative appointees.” Those courts handle 30,000 cases per year. Last year’s infamous decision by the Supreme Court in Ledbetter v. Goodyear has been cited over 250 times by other courts in decisions ranging from fair housing to retirement benefits.